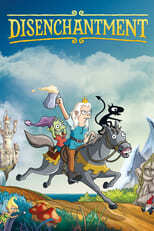 Where can you stream Disenchantment? On 2018-08-17 Sci-Fi & Fantasy/Animation TV Series Disenchantment first aired on Netflix. Written and created by Matt Groening, and produced by The ULULU Company & The Curiosity Company, Disenchantment will return and was last broadcasted on 2018-08-17.